An innovative model for caring for frequent emergency department (ED) users is yielding positive outcomes in West Michigan. Under a grant from the Alliance for Health, leader of the Aligning Forces initiative in West Michigan, the Spectrum Health Medical Group Center for Integrative Medicine began its novel approach last year. The central goal of the Center for Integrative Medicine is to apply the bio-psycho-social model of care to an at-risk and non-mainstream patient population of west Michigan to improve health outside of the ED. Spectrum Health is a not-for-profit health system based in West Michigan and composed of 10 hospitals and 170 ambulatory sites. The Center was created in response to an issue identified by emergency and addiction medicine specialist R. Corey Waller, MD, MS, in 2008. During that year, almost 950 patients were identified as frequent ED users, visiting hospital EDs more than 10 times within a year. These patients were responsible for more than 20,000 total visits and an estimated $40 million to $50 million in costs. The Center's treatment team employs addiction specialists, psychologist, case managers, and social workers to confront not only the medical issues—often pain, addiction, or both—but also the psychological and social issues that may be exacerbating medical problems. Potential patients are often known by local hospital staff as they have visited the ED 10 or more times over the previous year. Through a health information exchange called Michigan Health Connect, physicians are now able to see records from all three health systems that have EDs in the Grand Rapids area as well. 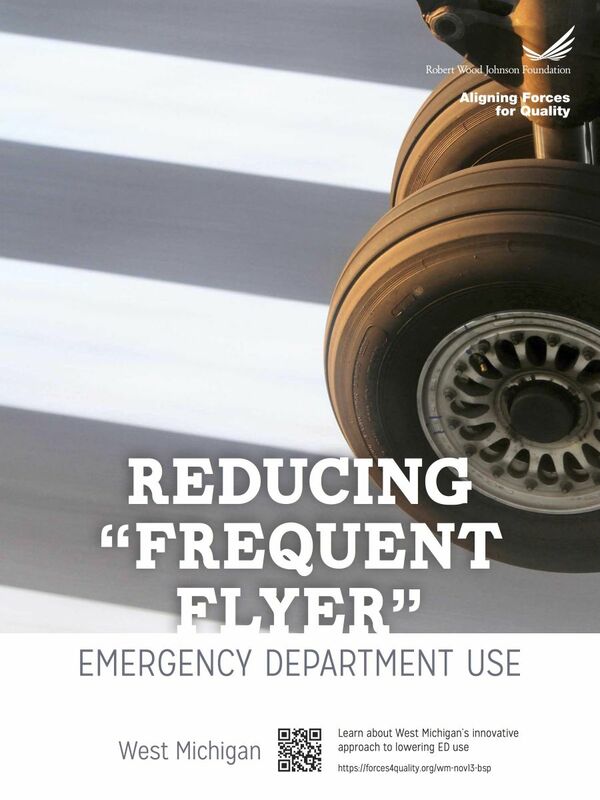 “The goal is to wean ‘frequent fliers’ away from the emergency room over time,” said Lody Zwarensteyn, Alliance for Health’s president and CEO. The center is physically located only 10 blocks from the nearby hospital in Grand Rapids, MI—a steppingstone to primary care. New patients undergo a series of in-depth evaluations, including a comprehensive exam with a physician trained in pain issues and psychiatric conditions, a mental health evaluation, an addiction assessment, and a case management evaluation. Each patient is given a unique care guide to suit his or her specific needs. Progress is monitored for six to 12 months. “Originally, we thought that monitoring might take three months. We’ve found that you can stabilize within three months, but it takes longer to actually fix problems like no transportation or behavior issues,” said Waller. If doing well, patients are then transferred to the care of a primary care physician. “That may mean putting them in the hands of a federally qualified health center or private practice, depending on the needs of the specific patient,” added Zwarensteyn. Cost savings have been significant as well. After treatment through the center in its first year, 75 out of 96 patients had lower health care costs. Average monthly charges for those in the Center’s program have dropped from approximately $5,400 to $2,900. The center is helping improve lives for patients with complex problems while reducing costs.